The picks from the 9 bracket options in the previous post were plugged into an "8 methods" league (the 9th is a composite) so that we could track which was most effective. After one day, the system that adjusts for the most experienced guards was the best method - picking 14 of 16 games correctly to land in the 99th percentile. The other big winner was the system that adjusted for the hottest teams, which picked 13 of 16 games correctly to land in the 92.7 percentile. Three other systems were above average with 12 of 16 correct picks, including the system that adjusts www.kenpom.com based on injuries, the system that picks a worse seed if they are only slightly behind, and the system that goes with the team with the best three Value Add players. However, that last system was incredibly damaged with the Arizona loss, as that was the only of the 9 systems that picked Arizona to win more than one or two games total. That loss is actually good for the other 8 methods because most other people had Arizona winning a number of games. 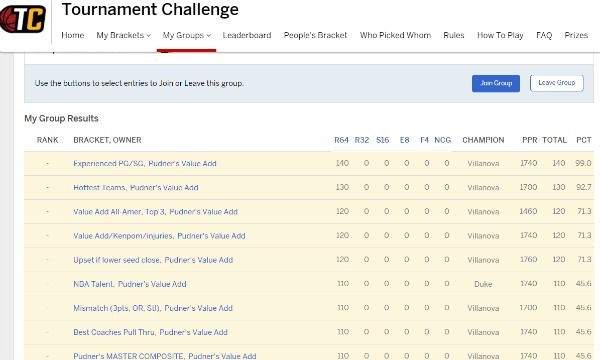 The other four systems finished just below average with 11 of 16 correct picks (the average national bracket was between 11 and 12 wins). Neither the potential NBA talent or the more experienced tournament coaches did that well. Both the composite system and the Mismatch system nearly registered a huge win having picked the 14th seed Stephen F. Austin in what I called my most stupid pick, and SFA led until there were four minutes left in the game. If anyone based their bracket based on believing the Pac12 would make a run - they had a terrible day with all three Pac12 teams losing to teams from New York. Included was 4-seed Arizona losing by 21 points to Buffalo. ACC fans also went 1-3 on Thursday and will need to hope for wins from some of their five teams still in action tomorrow or risk repeating last year when only one of nine ACC teams made the Sweet 16 (though that one UNC did win the title). The Big East and SEC both have four games tomorrow to try to build on their 2-0 and 4-0 starts Thursday, respectively.